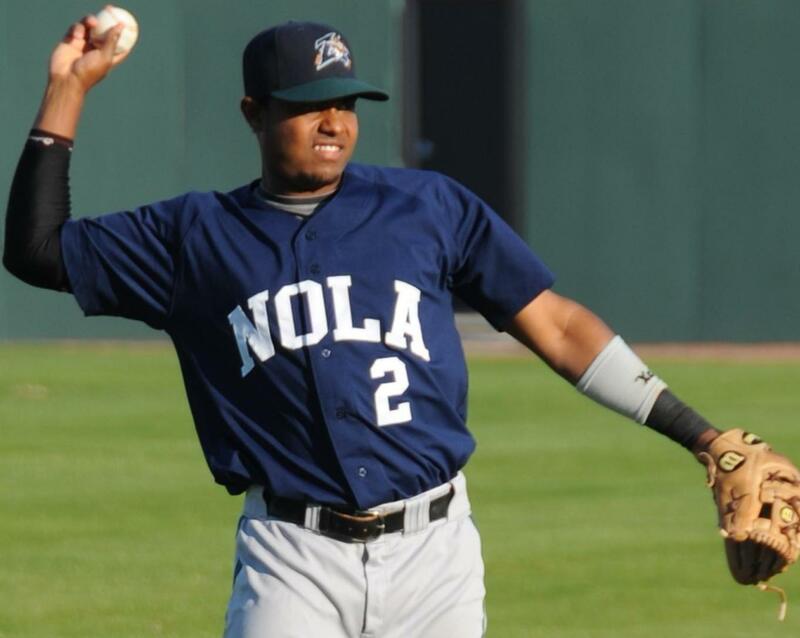 After a few weeks of courting, Revolution Baseball Operations Manager Andrew Ball has made official the signing of infielder Dallas McPherson. He’s primarily a first and third baseman who could see a little outfield time. There were two other Atlantic League teams in competition for his services, but he chose to come to York, and is joining the team in Bridgeport before they return home. McPherson was the 57th overall pick by the Angels in the 2001 draft out of The Citadel. He debuted in the Majors just three seasons later with Anaheim, appearing in the big leagues with them three seasons from ’04 through ’06. 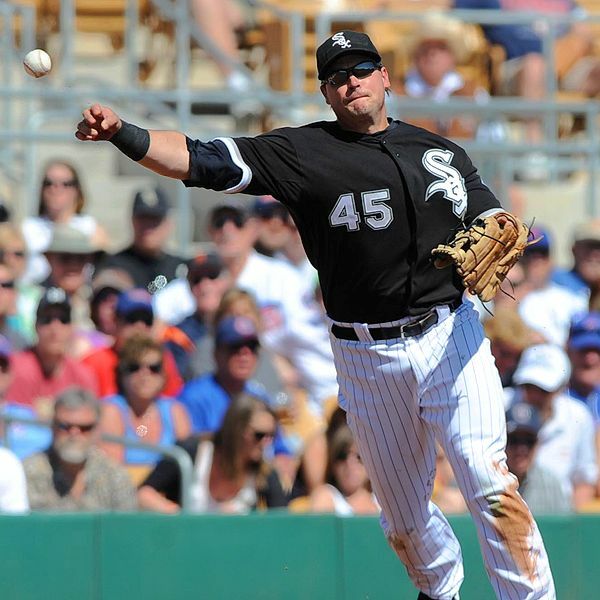 He returned to the show with the Marlins in 2008 and last played in an MLB game in 2011 with the White Sox. All told he has 139 games of Major League experience batting .241 with 18 home runs and 45 RBI. In 874 minor league games upon joining York, McPherson has slugged 209 homers with 704 RBI and is a .289 career hitter. He has two 40-home run seasons to his credit – first in 2004 when he smashed 20 at both Double-A Arkansas and Triple-A Salt Lake, then added three more with the Angels for a total of 43 dingers and 132 RBI for the season at all levels. In 2008 at Triple-A Albuquerque, he hit 42 homers and drove in 98 runs. McPherson split last season between Triple-A Charlotte (White Sox) and Triple-A Indianapolis (Pirates). Perhaps already the best story in baseball this year, it just keeps getting better for Scott Rice. 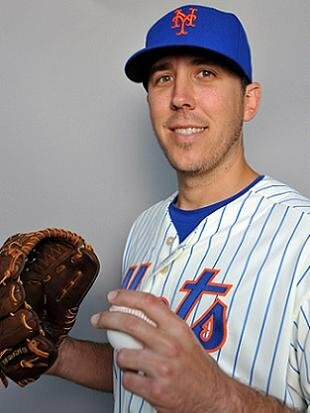 May 28 against the Yankees at Citi Field, he picked up his third career MLB win in spectacular fashion. Trailing 1-0 in the top of the 9th, Rice entered and tossed another scoreless inning. He did allow an infield hit to Ichiro on a swinging bunt off the handle, but then picked him off 1-3-6. Isn’t that just a story to tell forever. It got better however – when Mariano Rivera entered for the save, he allowed three consecutive hits to Daniel Murphy, David Wright and Lucas Duda to win 2-1 and hand Rivera his first blown save of the year. So for one night at least, Rice can say he out-dueled Rivera for an inning in the Subway Series and picked off another possible Hall of Famer to boot. 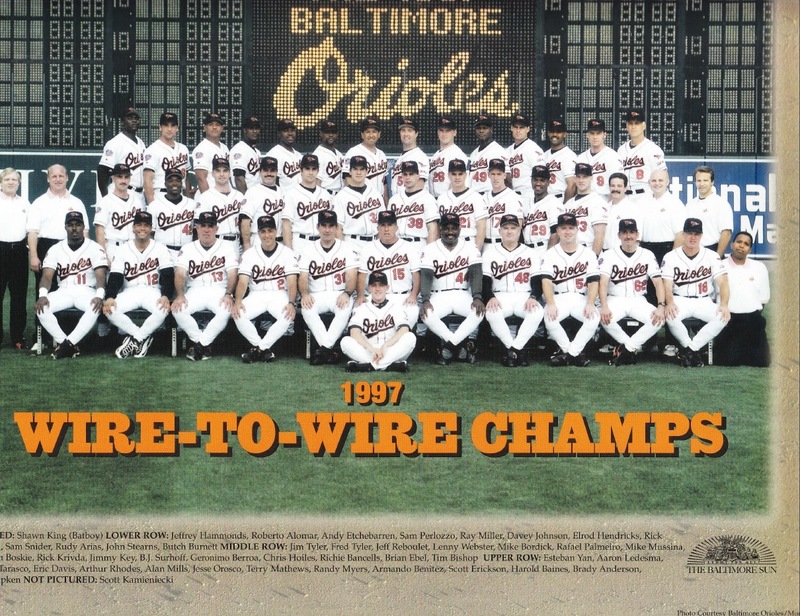 Click on the 1997 Orioles team photo below for the full-size version. While the Revolution would not debut until 10 years later, there are plenty of Revs ties in this photograph. Familiar faces you might recognize: Former Revolution Managers Andy Etchebarren and Chris Hoiles and former Revolution third base coach Sam Snider. 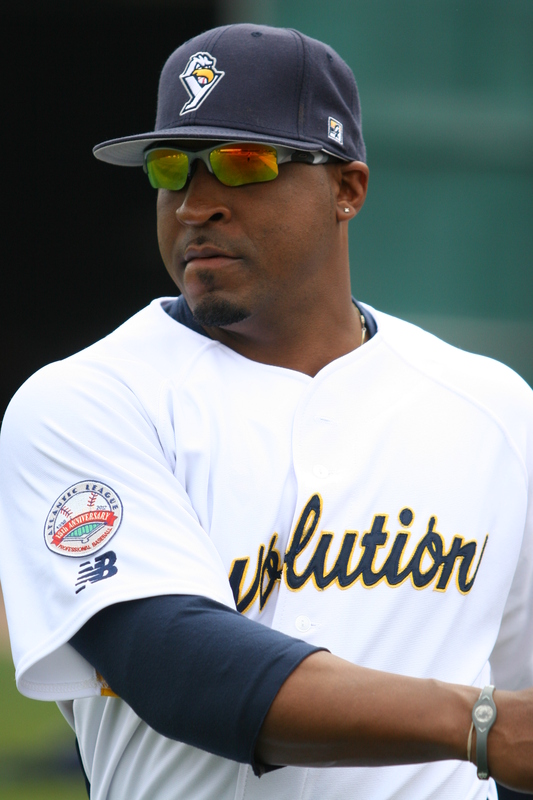 Etch was a coach on Davey Johnson’s staff, and turned down the opportunity to join his Washington Nationals staff to end his career with the Revolution and ultimately retire. Snider was the O’s bullpen catcher, and road roommate of Hoiles, who of course was still an active player at the time en-route to being inducted into the Orioles Hall of Fame at Camden Yards. Former (then future) Bridgeport Bluefish pitcher Esteban Yan is also in there. For some reason, the bat boy’s uniform in front has a typo on it. Look closely, I’m pretty sure it says “Oriols.” How do you forget the e? Before Saturday’s game at Camden, the Revolution added minor league veteran infielder Manuel “Manny” Mayorson to the roster. This is Mayorson’s 14th professional season after debuting as a professional with the Toronto Blue Jays organization in 2000. Mayorson has enjoyed Triple-A time with the Blue Jays, Marlins and Nationals organizations, and played last season at both Triple-A Syracuse and Double-A Harrisburg with Washington. A veteran of over 1,300 minor league games, Mayorson is a .269 career hitter. He knocked in a career-high 55 runs in 2006 at Double-A New Hampshire in the Toronto system, and came close to that mark with 54 RBI in 2011 at Triple-A Las Vegas, in just 97 games. Througout his career the veteran has seen extensive time at short, second and third, providing the Revolution with some defensive versatility. The roster is back at the pre-June 1 max of 27 players, as no one was released as a part of this transaction. We’re now exactly one week away from the deadline where all Atlantic League active rosters must be at 25 players for the remainder of the season. Outfielder Tyler Graham has been released by the Revolution. In 24 games, Graham struggled to get in a groove, posting a .245 average without a home run and nine RBI. It was assumed Graham would be York’s regular lead off hitter and center fielder, but it hasn’t worked out. Graham ended last season in the Major Leagues, appearing in 10 games for the Arizona Diamondbacks as a September call-up. The Revolution’s active roster now sits at 26, and must be at 25 for the remainder of the season on June 1. When he was re-signed to the Revolution roster on May 10, James Shanks only needed seven hits to tie Scott Grimes for the all-time franchise lead at 374. On Tuesday night at home against Sugar Land, Shanks picked up hit number eight and 375 in grand style. Trailing the Skeeters 6-3 with runners at the corners and two out in the bottom of the eighth, Shanks crushed a double off six-season Major League vet Gary Majewski to the right field gap, plating both runners to cut the lead to 6-5 in a game York was trailing 6-0. Unfortunately they couldn’t complete the comeback and lost by the same score, but that didn’t hurt a great moment when Shanks took hold of the record. It was Shanks’ second hit of the game, as he tied the record on a second inning single, receiving a nice ovation from the crowd on both occasions. He is also now the franchise leader in multi-hit games. As of May 21, Shanks is also second on the Revolution all-time RBI list with 195. He trails only Ramon Castro at 214. That record could be in reach some time soon as well. Shanks, 34, was originally drafted by the Kansas City Royals in 1998, and is in his 15th professional season. He ascended to Triple-A with both the Royals and Marlins organizations. It’s a few days old, but the information is basically the same; former Revolution (’11) left-hander Scott Rice leads the Majors in appearances out of the Mets bullpen. As of May 20, he’s pitched in 25 games. He’s on pace for around 100 appearances, which would set a New York Mets record. I’m guessing after waiting for this opportunity through 14 minor league seasons, Rice is more than happy to pitch in as many Major League games as possible. He’s pitched 20.2 innings in those 25 games with a 3.05 ERA so far, and has 13 strikeouts. On May 19, Rice earned his second career MLB win after he retired all six batters he faced with a strikeout in the 7th and 8th in Chicago, in his first big league appearance at Wrigley Field. Daniel Murphy’s solo home run in the top of the 8th put the Mets ahead for good 4-3, making Rice the pitcher of record. It was also his first MLB win on the road. His first big league winning decision came at Citi Field in Queens with the Mets 4-3 triumph over the Marlins on April 7.